"Paris Exposition, 1900" redirects here. 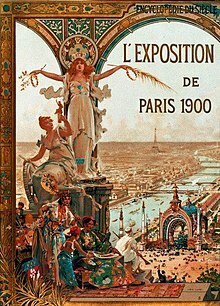 For the film series, see Paris Exposition, 1900 (film series). The Exposition Universelle of 1900, better known in English as the 1900 Paris Exposition, was a world's fair held in Paris, France, from 14 April to 12 November 1900, to celebrate the achievements of the past century and to accelerate development into the next. The style that was universally present in the Exposition was Art Nouveau. The fair, visited by nearly 50 million, displayed many machines, inventions, and architecture that are now nearly universally known, including the Grande Roue de Paris Ferris wheel, Russian nesting dolls, diesel engines, talking films, escalators, and the telegraphone (the first magnetic audio recorder). The staging of the first Exposition Universelle (1855) was motivated by a desire to re-establish pride and faith in the nation after a period of war. The succession of expositions followed the same theme: the regeneration of nationality after war. Eight years before the launch of the 1900 Paris Exposition Universelle, the Republic of France announced the exhibition to be one that welcomed and celebrated the coming of a new century. Countries from around the world were invited by France to showcase their achievements and lifestyles; the Exposition Universelle was a uniting and learning experience. It presented the opportunity for foreigners to realize the similarities between nations as well as their unique differences. New cultures were experienced and an overall better understanding of the values each country had to offer was gained. The learning atmosphere aided in attempts to increase cultural tolerance, deemed necessary after a period of war. The early announcement and the massively positive response disenchanted the interest that had been circling around the first German International Exposition. Support for the exhibition was widespread; countries immediately began to plan their exhibits, but despite the enthusiasm, the 1900 Paris Exposition Universelle was not a financial success as only two thirds of the expected public attended. It is suspected that the Exposition Universelle did not do as well financially as expected because the general public did not have the funds to participate in the fair. The 1900 Paris Exposition was so expensive to organize and run that the cost per visitor ended up being about six hundred francs more than the price of admission. The exhibition lost a grand total of 82,000 francs after six months in operation. Many Parisians had invested money in shares sold to raise money for the event and therefore lost their investment. With a much larger expected turnout the exhibit sites had gone up in value. Continuing to pay rent for the sites became increasingly hard for concessionaires as they were receiving fewer customers than anticipated. The concessionaires went on strike, which ultimately resulted in the closure of a large part of the exposition. To resolve the matter, the concessionaires were given a fractional refund of the rent they had paid. The financial consequences of the 1900 Exposition Universelle were devastating for many Parisians and led to the decision to end the streak of international fairs with the 1900 loss. The 1900 Paris Exposition was where talking films and escalators were first publicized, and where Campbell's Soup was awarded a gold medal (an image of which still appears on many of the company's products). At the exposition Rudolf Diesel exhibited his diesel engine, running on peanut oil. 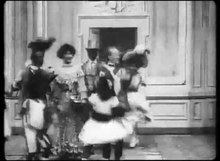 Brief films of excerpts from opera and ballet were apparently the first films exhibited publicly with projection of both image and recorded sound. The exposition also featured many panoramic paintings and extensions of the panorama technique, such as the Cinéorama, Mareorama, and Trans-Siberian Railway Panorama. The centrepiece of the Palais de l'Optique was the 1.25-metre-diameter (49 in) "Great Exposition Refractor". This telescope was the largest refracting telescope at that time. The optical tube assembly was 60 meters long and 1.5 meters in diameter, and was fixed in place due to its mass. Light from the sky was sent into the tube by a movable 2-meter mirror. The Exposition included "The Exhibit of American Negroes" (Exposition Nègres d'Amerique), during which photos by Frances Benjamin Johnston, a friend of Booker T. Washington, of his black students of the Hampton Institute were presented. Partly organized by Booker Washington and W.E.B. Du Bois, this exhibition aimed at showing African Americans' positive contributions to American society. Many of the buildings constructed for the Exposition Universelle were demolished after the conclusion of the exposition. Many of the buildings were built on a framework of wood, and covered with staff, which was formed into columns, statuary, walls, stairs, etc. After the fair was over, the buildings were demolished and all items and materials that could be salvaged and sold were "recycled". The Finnish Pavilion at the Exposition was designed by the architectural firm of Gesellius, Lindgren, and Saarinen. A special committee, led by Gustave Eiffel, awarded a gold medal to Lavr Proskuryakov's project for the Yenisei Bridge in Krasnoyarsk. Russian sparkling wine defeated all the French entries to claim the internationally coveted "Grand Prix de Champagne". The exposition also was the showcasing of another Russian entry, the famous matryoshka doll (Russian nesting doll). The Art Nouveau ("New Art") style began to develop in the 1880s and became fashionable in Europe and the United States during the 1890s. The art form takes inspiration from the natural world, drawing references from botanical studies and deep sea organisms. Fluid twisting, curving lines and a "whiplash" effect are the trademarks of the natural art form. The art form took shape in works ranging from painting to sculpture and most notably architecture, appearing throughout the 1900 Paris Exposition Universelle. Structures such as the Porte Monumentale entrance, the Pavillon Bleu and the Grand and Petit Palais were largely oriented around the Art Nouveau theme. The legendary Sèvres Porcelain Manufactory saw the Exposition as the perfect opportunity to illustrate their mastery of the Art Nouveau aesthetic through a monumental pair of swan vases. Though Art Nouveau was showcased in the 1900 Exposition it was minutely used in the 1889 Paris Exposition by Emile Galle in a glass work project. The small piece was the beginning of a massive fair to come, based very much on the art form. The architect René Binet created the triumphal gateway, La Porte Monumentale Paris, on the Place de la Concorde as a whimsical piece of art and a means to attain tickets. The gateway consisted of a dome and three arches, and housed the fifty-six ticket offices for the exhibition visitors. As a work of art, the monumental gateway was ornate, strange and 'lacking in taste' and considered by exhibition goers to be the ugliest of all the exhibits. The prow of a boat protruded from the middle of the main arch, directly under the fifteen foot Parisienne statue perched atop the structure. Adding to the overall dislike of La Porte Monumentale Paris was the Parisienne, made by Moreau-Vauthier. The Parisienne was 'regarded as the triumph of prostitution' because of her flowing robe and modernized figure and was criticized by many visitors to the triumphal gateway. The structure as a whole was adorned with Byzantine motifs and Persian ceramic ornamentation, but the true inspiration behind the piece was not of cultural background. Binet sought inspiration from the science, tucking the vertebrae of a dinosaur, the cells of a beehive, rams, peacocks, and poppies into the design alongside other animalistic stimuli. La Porte Monumental Paris is considered to be a structure of the Salammbô style and 'the most typically 1900 monument of the entire exhibition'. The controversial gateway became known as La Salamanda among the public because it resembled the stocky and intricately designed salamander-stoves of the time, only adding to its ridicule. The Grand Palais, a heavy stone structure on the outside and a light iron and glass arena on the inside, held in it ‘an exhibition hall for sculptures, a track for horse shows, and the Motor Show’. The Grand Palais combined history and modern elements together; the exterior was reminiscent of the Neo-Baroque style, which focused on the glory of empires, paired with the interior, designed as an Art Nouveau inspired atmosphere. The most recognized Art Nouveau structure within the Grand Palais is the iron staircase whose railings are intricately woven in fluid, organic shapes. The Art Nouveau inspired structure, the Petit Palais, was constructed by the architect Giraud. The Petit Palais was constructed to hold the exhibition of French art, but is known mainly for its Art Nouveau inspired iron work and general design. Much like the Grand Palais, the Petit Palais combines the styles of Neo-Baroque and Art Nouveau. Giraud’s palais is reminiscent of the Grand Trianon and the stable at Chantilly. The widely loved entranceway was painted by Albert Besnard and Paul Albert Laurens, and is known to be the only artifact of decorative troupes. The intricately designed iron flowed into a seamless pattern and paired with the colonnade of pink marble drew in visitors. The piece was associated with the French pavilion. The Palace of Electricity moderated all the energy flowing from one exhibit to the other, and each exhibit was dependent on the palace in order to run. The Palace of Electricity itself was fitted with five thousand multi-coloured incandescent lamps and eight monumental lamps on its massive one hundred and thirty meter breadth and seventy meter height. Steam driven dynamos pumped the fuel necessary to run the entire exhibition, and they were put on display attached to the Palais de l`Électricité. It was a glowing beacon of life in the exposition, quickly becoming the heart of the fair. Aside from the machinery involved in the palace’s attraction people were drawn to its exterior decorations. The top of the building was ornamented with the figure of a chariot led by hippogryphs and spewed multi-coloured flames. People were drawn to its extravagant performance and the amount of work needed to run the fair itself. The Palais de l`Electricité was one of the most loved exhibits of the exhibition. The architects were Eugène Hénard and Edmond Paulin. Each country funded, designed and on occasion constructed their pavilions, carrying the burden of some of the cost of the fair and the also the glory that followed in the praise of their homeland contributions. The British Royalty pavilion, one of the largest exhibits, consisted of a mock-Jacobean mansion decorated with pictures and furniture, constructed by Sir Edwin Lutyens. Lutyens based his design on 'The Hall' in Bradford-on-Avon, Wiltshire. Also known as Kingston House, The Hall (home of the Moulton family) was built around 1610 on the site of a much older manor house. The pavilion was intended to provide the Commissioner with an Englishman's castle on the site of the exposition. The public found it to be less grand and were aware that the intention of the exhibit was not for the public, therefore recognizing it as more of an annoyance than an exhibit. The German pavilion, the second largest exhibit, was held in a large tower resembling a beer-hall, made out of wood and stained glass, inspired by Kaiser Wilhelm II, who was in power at the time. Inside the tower Germany presented the comfortable living of the country through the display of their passenger-liners and their successfully growing merchant navy through the pictorial reference of the scale model of the Rothe Sand lighthouse in Germany. "[T]he colossal vestibule of the German section on the Esplanade des Invalides... the rooms fully furnished by the upholsterers and cabinet-makers of Berlin and Munich; the colossal pavilion of machines; the colossal installations of the metallurgy and agriculture sections..." said Andre Hallays of the German pavilion. The most ornate and whimsical pavilions were those of the Austrian domains in the Balkans, Bosnia and Herzegovina. They offered displays on their lifestyles, consisting of folklore traditions, highlighting peasanthood and the embroidery goods produced in the country. The Austrian pavilion succeeded in uniting the styles of Art Nouveau and Classicism through their embroidered goods and decorated palace. The Hungarian cupola displayed mainly their skillful agricultural produce and hunting equipment. Finland claimed the most revolutionary exhibit with its clean cut, simple and careful details. Sweden's yellow and red structure covered in pine shingles drew much attention with its bright, welcoming colours, and was a crowd favourite. The American pavilion, by contrast, attracted negative interest among those who were not from the United States. The exhibit, a post office inspired building resembling the structures of Chicago, became a base for American visitors and offered little for foreigners to enjoy. American Loie Fuller performed shows in her own theatre, a dance routine aided by coloured lights and costume. Fuller's intention was to bring the Art Nouveau female, Salomé, to life. Her performance helped introduce revolutionary audio-visual entertainment precursors of early motion picture equipment. She was filmed on ten 70mm projectors that created a three hundred and thirty degree picture, patented by Cinéorama. Cinéorama used "handcoloured films, phonograph music and live commentary" to bring to life Loie Fuller as the Art Nouveau figure, Salomé. The Netherlands in this exposition displayed the exotic culture of its crown colony, the Dutch East Indies pavilion (today Indonesia). The pavilion displayed a faithful reconstruction of 8th-century Sari temple and also Indonesian vernacular architecture of Rumah Gadang from Minangkabau, West Sumatra. The Tour du Monde pavilion displayed a collection of exotic oriental architectures, such as the Siamese pavilion, Japanese pagoda, and Indian pavilion. The Korean Pavilion was mostly stocked by French Oriental collectors, including Victor Collin de Plancy, with a supplement of Korean goods from Korea. One object of note on display was the Jikji, the oldest extant book printed with movable metal type. The 1900 Paris Exposition Universelle hosted the first Olympic Games outside of Greece. The event was crafted to fully complete the expectations of the exposition's broad scope of interests. The games were few and winners were given tie-pins and pencils alongside one hundred francs used to buy their own medals. The exposition also held a dinner for the French President, M. Loubert, and 20,777 in attendance at the fair. The dinner was prepared in eleven kitchens and served to 606 widespread tables, with the orders and needs of each table supervised by telephone and vehicle. The enormous dinner was reviewed as a show of the unity and success of the French Republic. Included in the exposition were various exhibitions of French colonies, particularly those of Sub-Saharan Africa. These exhibits were used to exemplify African primitiveness versus French power, technology, and culture. Human zoos, or miniature villages with African people participating in "authentic" activities such as art, music, and military training, were meant to educate and entertain the French public. Often ethnographic, economic, and geographic information accompanied the exhibits. They depicted Africans as inferior and exotic but also capable of advancement, based on stereotypes that usually incorrectly portrayed and degraded the people involved. The message presented by the African human zoos, eliciting confidence in the French race itself, supported the advancement of the French civilizing mission to the public. The Madagascar exposition included a Malagasy-style pavilion, huts, and Malagasy people working. Animals were imported to form part of the outdoor "Malagasy environment" that included native vegetation and landscaping. Additionally, there was information about the agriculture, including samples of the colony's common exports: coffee, cocoa, rubber, and tobacco. Maps and charts displayed the region's terrain, cities, and infrastructures, while people worked on making clothes, baskets and shaping gold. The Madagascar people also participated in colonial "fêtes" that were used to draw attention and display exotic cultural traditions and trained troops amongst a variety of indigenous groups. Small classrooms used for language instruction and music lessons allowed French exposition-goers to witness the "civilizing" of the people. By studying the effectiveness of the civilizing mission in action in these sort of foreign showcases, the French reinforced their superiority. The Dahomean portion of the exposition attempted to portray the Dahomey people as both savage and progressively militarized. Similar to the other groups represented, the miniature Dahomey included a pavilion, maps and charts, agricultural and ethnographic objects, and a tall military post tower. The people, consisting of ten men from the civilian guard, seven artisans, four servant boys, and five wives, participated in festivals, artistry, and music. They were also displayed in classrooms, but refused to engage in any sort of scientific efforts involving physical examination and study. The civilizing mission was supported by the presentation of the Dahomean as militarized but still savage and in need of a French education. The Senegalese exhibit included mainly soldiers and artisans and was located in the West African pavilion, which emphasized the main exports and artistic products of the region. In this exhibit, the French did not portray the Senegalese as being as savage as other African peoples. Though they did still attend language classes, they served as "model" Africans because of their longstanding contact with the French which had already greatly "civilized" them. These exhibits largely aimed to display the most "authentic" African person, the most exotic and savage, next to assimilating groups in order to prove that the civilizing mission was successful. The French public was often unaware of just how inauthentic the colonial exhibits were, as they consisted of Africans who were paid to come from Africa to act in "authentic" African ways and were contained in artificial pavilions designed by Europeans. ^ Dekorative Kunst 3 (1900): 457-63, and in L'Architecture à l'Exposition Universelle de 1900, p. 65, Pl. X. Paris: Librairies-Imprimeries Réunies, 1900. ^ "ArtfixDaily.com ArtGuild Members". www.artfixdaily.com. Retrieved 2015-11-24. ^ lemaire, philippe. "Paris 1900 - Corée - Nations et Colonies Etrangères". www.worldfairs.info. ^ "Les points sur les i - Madame Choi". 28 July 2006. ^ Hale, Dana S. (2008). Races on Display: French Representations of Colonized peoples, 1886-1940. Indiana, USA: Indiana University Press. pp. 23–46. ISBN 0253218993. Alexander C. T. Geppert: Fleeting Cities. Imperial Expositions in Fin-de-Siècle Europe, Basingstoke/New York: Palgrave Macmillan, 2010. Wikimedia Commons has media related to Exposition Universelle (1900). 1900 Paris at the BIE. Retrieved April 22, 2019. 1900 Paris, a section of Jon Paul Sank's World's Fairs Page. The section has more than 120 links, including to archival footage, documentaries, television, 3-D reconstructions, view books, pictures, guides, maps, catalogues, conference audio, books, music, digital collections, and items about exhibits and pavilions. Retrieved April 22, 2019. Exposition Universelle 1900 in Paris. Photographs at L'Art Nouveau. Retrieved April 22, 2019. 1900 Palace of Electricity. Thomas A. Edison. Retrieved 2009-05-20. 1900-08-09 1 minute film pan shot from Champ-de-Mars. Retrieved April 22, 2019. 1900 Panoramic view of the Place de l'Concord. Thomas A. Edison. Retrieved 2009-05-20. 1900-08-29 1 minute 39 seconds film pan shot from Place de la Concorde. Retrieved April 22, 2019. 1900 Esplanade des Invalides. Thomas A. Edison. Retrieved 2009-05-20. 1900-08-09 2 minute film pan shot from Esplanade des Invalides and 10 seconds of Chateau d'Eau from Tour Eiffel. Retrieved April 22, 2019. Inventing Entertainment: The Early Motion Pictures and Sound Recordings of the Edison Companies: "exposition universelle internationale de 1900 paris, france" (search results). A set of films by Edison from the Expo 1900. Retrieved April 22, 2019. Unrecognizable Paris: The Monuments that Vanished, an article at Messy Nessy Cabinet of Chic Curiosities. Retrieved April 22, 2019. The Burton Holmes lectures; v.2. Round about Paris. Paris exposition at Internet Archive. Retrieved April 22, 2019.